Happy Wednesday everyone! This post was suppose to go up yesterday but I forgot to schedule it... #oops So it's going up today instead! I'm back bringing you my absolute must have for Hawaii! These are the things that you definitely, 100%, need to bring when traveling to the islands. These are things that I personally brought, except for the underwater camera, that made my trip 108310280284 times better. They are items to not forget to pack! #1: GoPro camera// If you plan to do crazy stuff like skydiving, parasailing, snorkeling or scuba diving a GoPro is a must to capture all the insanely cool stuff you're doing. The basic model starts at $129 and goes up. I recommend getting the LCD backpanel so you can see what you are filming. We have it and it makes the world of a difference. #2: Underwater camera// We didn't have one but we wish we did! While the GoPro is nice for video we wish we would have brought a nice underwater camera to get photos of the turtles, fish, each other, etc. The one I have listed is a nice quality one that's reasonable too! I'm definitely picking one up for my next trip! #3: Rashguard// I had this in my What to Wear in Hawaii post and for good reason this is one of the main reasons why I didn't get fried from the sun. The Hawaii sun is soooo much hotter than the California sun and take that with being on the surface of the water which reflects and it's so easy to get fried to a crisp when snorkeling or being in the ocean for long periods. I took my rashguard everywhere with me and wore it whenever we were in the water. You can get them online for around $25 and up from various surf brands either long or short sleeve. The one I linked is O'Neill and under $30 and comes in 4 colors. Definitely either bring one with you or buy one there. I promise you will not regret it! #4: Beach bag// A beach bag is definitely a must have if you're going to be spending your time at the beach or doing water activities. I recommend a flexible one that's pretty large so you can pack a ton in it. I also like the ones that are mesh/ woven so that sand can fall out. #5: Swell bottle// If there are two things you need to bring with you it is a rashguard and a Swell bottle. They are the greatest water bottles in existence. They are triple insulated and keep your drinks cold for 24 hours. We would put just cold water in them in the mornings and all throughout the day, whether we were hiking, snorkeling or walking around the water stayed cold. It was so refreshing and nice when we were hot! They're a bit pricey but worth every single penny. I have the 25 ounce which is perfect. It wasn't too much or too little of water and fit in my brother's little backpack. I definitely recommend getting one! #6: Lunch box// To save time and money at lunchtime we packed our own lunches. We went to the ABC Store and bought some pre-made sandwiches, chips, apple sauce, granola bars, cookies and other little snack items for our lunch for the week. Make sure to get an insulated one so your cold stuff like sandwiches don't get warm/go bad! The one I linked is flexible so perfect to fit into your suitcase, has a ton of space for water bottles plus lunch and is under $15! We packed ours and then filled it with items like socks, underwear, etc. to maximize suitcase space. #7: Sunscreen// Even if you think you're tan enough you're not. The sun is so much hotter in Hawaii. Wear sunscreen or else you're gonna be miserable. Sun Bum is one of my favorites! You can either bring it with you or buy it there. #8: Patagonia backpack// I bought this Patagonia backpack for my upcoming travels and used it for Vegas and fell in love. It is the perfect size to hold a whole arsenal of items but doesn't feel heavy or bulky. It's padded which is nice and let's you be hands free without worrying about if someone is going to steal it off you. I HIGHLY recommend picking one up. #9: Portable charger// If you are going to be out exploring, taking photos/videos, using maps/gps, etc., you 10000000000% need a portable phone charger! I actually carried 3 on me in case someone in our group needed one. I always keep them with me when traveling because you don't want to be stuck without a phone in a place you've never been so a portable charger is a must. You can get them anywhere from Walgreens to Target to Best Buy and they start at $5 to $50. #10: Snorkel set// We went snorkeling 3 times while we were in Hawaii and we brought our own snorkel set. Unfortunately one of my flippers snapped the first time so I had to rent some from Snorkel Bob's but it only cost me like $12 for the entire week. I did like having my own mask and snorkel just for.... sanitary reasons. Lol. It was also nice to have our stuff if we were driving along and decided to stop off and snorkel. You can get a set from the ABC store there for like $25 or get one before you arrive or you can use the ones they provide on the tours or rent one from Snorkel Bob's. #11: Handsoap// It bothers the living life out of me that hotels don't have handsoap in the bathroom! I don't like using the dumb little bar soap so I always pack handsoap in a travel size pump container. I know it's a little weird but it's sooo much easier and nicer than the crappy bar they provide. Just try it and tell me how great it was having actual real soap! 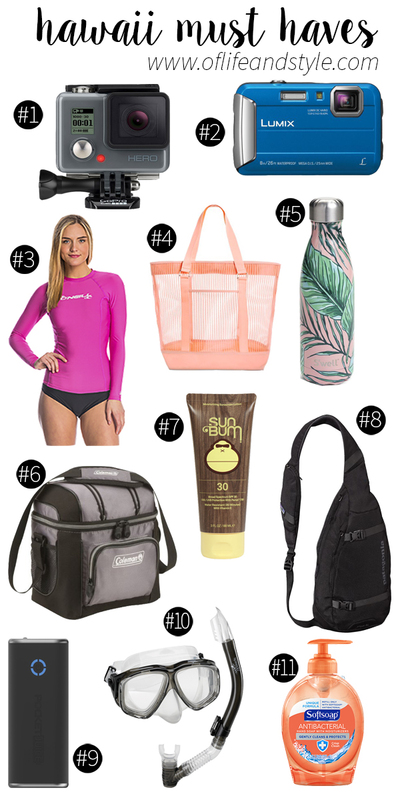 These are the 11 items that are must haves for Hawaii or really any tropical trip! You won't regret bringing them I promise! You can catch up on my Hawaii posts with my Day 1 vlog and my What to Wear post! What are your must haves for Hawaii? What should I add to my list for next time? Share in the comments below!